The great Chuck Mindenhall has a nice piece on the immediate reaction to the announcement of Hendo/Cormier at UFC 175. Go read it. Do it. Mindenhall spends a lot of time discussing the adverse reaction to the fight in terms of people believing Dan Henderson could get hurt (due to age and no TRT, mostly). When discussing Hendo, his age will always be a red herring, and the history of TRT will always be the first arrow in the quiver that his critics reach for. I’ve said it before that people count out Hendo to their own detriment. However, I’m not convinced the reaction to the announcement has to with Hendo’s age as much as it has to do with his last showing against Shogun and the damage he has accumulated. For two rounds, Shogun made Hendo look bad. Like horizontal-stripes-on-a-fat-man bad. Yes, he rallied back and floored Shogun, and that deserves all the accolades and acclaim he’s received since the fight. However, some would stop short of saying that performance warrants the title-fight carrot dangling in front of the stick that is Hendo/Cormier. Critics will argue that Cormier doesn’t deserve that kind of incentive either considering his only fight at 205 was against a former barista. Everyone should tread lightly, though. Inviting comparisons against previous opponents is tricky business, and Hendo’s resume speaks for itself. Cormier’s list of fights is nothing to sneeze at either. In terms of immediacy, in terms of the present competition, rewarding Cormier makes sense. At heavyweight, he consistently fought bigger opponents, and his learning curve has been a lot steeper than Hendo’s. By the same token, Hendo is not unfamiliar to fighting within three different weight classes depending on the intrigue of his opponent. The more you begin to peel away the layers, the more you might notice that Cormier just may have the other half of the amulet Dan Henderson has worn since his career began. They have similar credentials in just about every area except one: mileage. Hendo has been doing this longer, has seen more damage, and has had a plethora of injuries. It’s the mileage that makes people wary of Hendo fighting Cormier. It’s the mileage that that takes the “paper parity” and sets it under a parakeet cage. Objectively, the fight is fine. I’ll be honest, though, I don’t like the fight from a personal perspective. It’s not a safety issue for Hendo that makes me wince thinking about Cormier and Hendo locking horns. It’s an issue that both Hendo and Cormier represent the good guys—the salty veteran; the rookie with an ocean of potential. 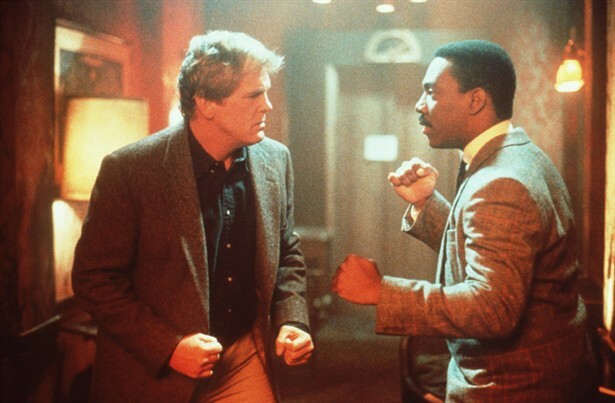 They are the Riggs and Murtaugh of the 205 class. They should be stopping diplomatic villains, not trying to knock each other senseless. This entry was posted in Fighting, MMA, Opinion and tagged Buddy Cop Movies, Chuck Mindenhall, Dan Henderson, Daniel Cormier, UFC 175. Bookmark the permalink.